Upcoming on May 26, 2018, the Asian American Orchestra is pleased to announce that the San Francisco International Arts Festival is presenting our world premiere of DOWN BY THE RIVERSIDE Requiem for a King composed by Anthony Brown with original spoken word by Angela Davis performed by the Asian American Orchestra and vocal ensemble Voices Of A Dream. The first half of the concert will present Brown’s GO FOR BROKE! commemorating the courageous Japanese American soldiers who fought and died in WWII and featuring spoken word by Janice Mirikitani. Following this will be the world premiere of DOWN BY THE RIVERSIDE Requiem for a King. On April 4, 1967, the Reverend Dr. Martin Luther King, Jr delivered his most controversial speech, “Beyond Vietnam—A Time to Break Silence” at the Riverside Church in New York City. King declared a strong antiwar stance questioning the nation’s military role and morality in Vietnam. This was deemed unpatriotic; he was vilified in the media and mainstream America. Even fellow civil rights leaders turned against him. One year later to the day, Martin Luther King, Jr. was assassinated. Brown and Davis honor King’s words from this speech, “A time comes when silence is betrayal,” with this vocal, multi-movement jazz work. DOWN BY THE RIVERSIDE inspires Americans to take a look at some of the issues Dr. King confronted that are still manifest within today’s society. The evening length concert begins with a presentation of Anthony Brown’s seminal work GO FOR BROKE!, a salute to Nisei Veterans that commemorates the 75th anniversary of the February 19, 1942 signing of Executive Order 9066, which forced over 120,000 people of Japanese ancestry into desolate internment camps during WWII. The public presentations of GO FOR BROKE! and DOWN BY THE RIVERSIDE aim to provide the public contemporary artistic interpretations of major historic events that have shaped and continue to inform our society. Today, with our current president stating that he “might have supported Japanese American internment,” it is vital that every American know our history so that we do not repeat it. Percussionist, composer, ethnomusicologist, educator and Smithsonian Associate Scholar Dr. Anthony Brown is a seminal figure in the contemporary California creative music scene, directing the Asian American Orchestra in addition to performances with Max Roach, Cecil Taylor, Pharoah Sanders, Zakir Hussain, Wadada Leo Smith, and the San Francisco Symphony. Since 1998, his Orchestra has received international critical acclaim for blending Asian musical instruments and sensibilities with the sonorities of the jazz orchestra. The Asian American Orchestra's recording of Duke Ellington’s Far East Suite received a 2000 GRAMMY nomination for Best Large Jazz Ensemble Performance. Professor Davis’ teaching career has taken her to San Francisco State University, Mills College, and UC Berkeley. She also has taught at UCLA, Vassar, Syracuse University the Claremont Colleges, and Stanford University. Most recently she spent fifteen years at the University of California Santa Cruz where she is now Distinguished Professor Emerita of History of Consciousness – an interdisciplinary Ph.D program – and of Feminist Studies. Poet, dancer, and community activist Janice Mirikitani was born in Stockton, California, and earned a BA from UCLA. With her parents, she was interned in an Arkansas camp during World War II and through her poetry and activism is committed to addressing the horrors of war, combating institutional racism, and advocating for women and poor people. Her collections of poetry include Shedding Silence (1987), We, the Dangerous: New and Selected Poems (1995), and Love Works (2001). In 2000, she was named the second poet laureate of San Francisco. Mirikitani is the founding president of Glide Foundation, an organization devoted to helping poor people in San Francisco. Mirikitani and her husband, minister and activist Cecil Williams, co-authored the book Beyond the Possible: 50 Years of Creating Radical Change in a Community Called Glide (2013), which describes the mission of their foundation and its work of empowering marginalized communities in San Francisco. Proclaimed as one of the “purest contemporary voices” by NPR, powerhouse Amikaeyla embraces the best of many types of music. MTV says “her sultry sound is like listening to velvet waterfalls and her soulful flavor captures the listener with dynamic passion and sincerity”. Winner of eight Washington Area Music Association Awards for Best Jazz, World and Urban Contemporary Vocalist, Amikaeyla was named DC’s best female composer and won the Mayor’s Arts Ward for Innovation in the Arts. She has studied, recorded with, and shared the stage with Take 6, Sweet Honey In The Rock, Sheila E, and Esperanza Spalding and was one of 6 people from around the world invited to perform for His Holiness the Dalai Lama. Currently, Amikaeyla serves as a Cultural Arts Ambassador for the US State Department and is the Founder and Executive Director of the International Cultural Arts & Healing Sciences Institute (ICAHSI). 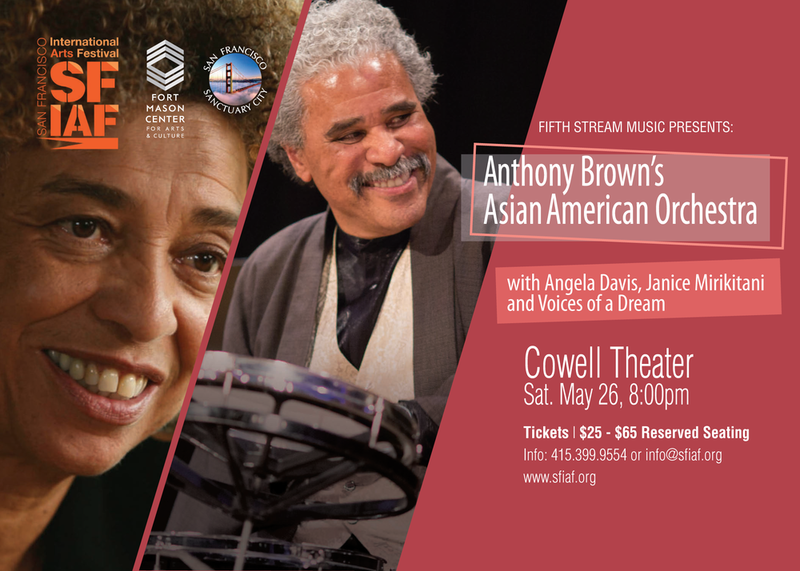 Anthony Brown’s Asian American Orchestra performs nationally at festivals, universities and cultural centers, garnering international critical acclaim including a 2000 Grammy nomination and a “5-Star Masterpiece” review in DownBeat magazine. Founded In 1998 as the touring cultural component of a federally funded national multimedia education program to address the internment, the Asian American Orchestra continues its original mission of promoting public awareness of the Japanese internment experience of World War II and social justices issues. The intercultural, intergenerational, and intergender Orchestra features traditional Asian instruments and music inspired by Gagaku, the ancient court music of Japan, the oldest continuous tradition of orchestral music on the planet. The vocal ensemble Voices Of A Dream was founded by the Asian American Orchestra in 2013 to complement their program, Our Eyes on the Prize: King’s Dream 50 Years On commemorating the 1963 March on Washington and Dr. King’s immortal “I Have a Dream” speech. Under the direction of Amikaeyla Gaston, VOAD specializes in Spirituals, Gospel and Freedom Songs and performs music to stir the soul. DOWN BY THE RIVERSIDE Requiem for a King was funded in part by the Phyllis C. Wattis Foundation, San Francisco Friends of Chamber Music, Zellerbach Family Foundation, and San Francisco Grants for the Arts.